Prescription eye drops can decrease eye pressure by slowing the production of fluids within the eye or improving the drainage flow. This may not be right for every patient because of the varying side effects; your eye care professional will provide the treatment option that is right for your condition. Glaucoma surgery improves the flow of fluids from the eye, relieving pressure on the optic nerve. Your doctor may use a highly focused laser beam, either to modify the existing drainage route or to create an alternate hole in the iris, depending on the type of glaucoma you have. Surgery can treat glaucoma, but it cannot reverse existing damage, so it is imperative to receive regular eye examinations to avoid damage before it happens. Glaucoma often develops with no symptoms, making it impossible for patients to detect until significant (and irreversible) damage has been done. For this reason, it is critically important to frequently be checked by an eye doctor for ocular hypertension (an irregularly high amount of intraocular pressure that can signal a person is at high risk for glaucoma). Chronic open angle glaucoma: the most common form of the disease, chronic open angle glaucoma results from a pressure build-up in the eye, and causes severe vision loss without the warning of noticeable symptoms. Its exact cause is unknown, although experts have speculated that the eye’s naturally diminishing ability to drain fluid may be responsible for high amounts of intraocular pressure, which can lead to damage of the optic nerve, and vision loss. Acute closed angle glaucoma: unlike chronic open angle glaucoma, arrives suddenly and painfully. It is extremely serious, and can cause permanent vision loss quickly. It comes as the result of a narrow drainage angle (or the area of the eye in between the iris and cornea being unable to drain fluid). Secondary Glaucoma: gets its name because it arrives as a result of something else, including previous medical conditions, injuries, irregularities, or medications. Normal-tension glaucoma: a form of glaucoma where tension in the eye is inexplicably normal, yet the optic nerve is still damaged. 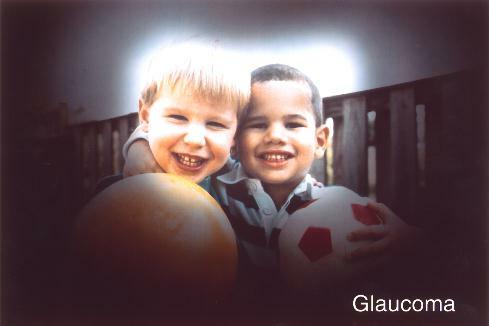 This is rare, considering glaucoma is usually characterized by a high amount of intraocular pressure.